Persistence Market Research (PMR) delivers a comprehensive breakdown of the global lanolin market, in its report titled 'Lanolin Market: Global Industry Analysis 2013–2017 and Forecast 2018–2028'. The prime objective of this report is to convey complete analysis and comprehensions affecting the lanolin market. To estimate the market value of lanolin, we have considered FY 2017 as the base year, and market values have been evaluated keeping in mind the trends, driving factors, and important developments by key market participants. 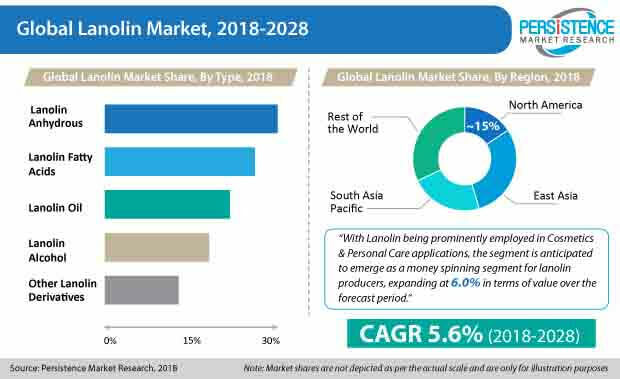 The compound annual growth rate (CAGR) for lanolin has been derived for the period of 2018 to 2028. Lanolin is also known as wool grease or wool wax. It is a type of wax secreted by the sebaceous glands of sheep. Commercially-used lanolin is obtained from domestic sheep breeds that are raised specially for their wool. High purity grade of lanolin is composed primarily of long chain waxy esters, lanolin alcohol, lanolin acids, and lanolin hydrocarbons. Lanolin and its derivatives find application in personal care, pharmaceuticals, leather & textile care, lubricants, and other industrial applications. This global lanolin market report contains more than 20 sections that describe market numbers in terms of volume in tons and value in US$ Mn, at the regional and global levels. The first section of the global lanolin market report covers an executive summary that elaborates on the trends being witnessed in the market, from the demand side as well as supply side. The subsequent section covers the global lanolin market introduction, including the market definitions of the segments considered, market taxonomy by grade, product type, application, and region, and other information significant to the market. In the following section of the global lanolin market report, we have included market viewpoints, including macroeconomic factors, forecast factors, Porter’s analysis, and value chain analysis, along with a list of distributors, manufacturers, and end users. The next section of the global lanolin market report comprises the global industry analysis by volume and value, along with pricing analysis for North America, Latin America, Europe, East Asia, South Asia Pacific, and the Middle East & Africa. The fifth section of the global lanolin market report includes qualitative as well as quantitative analysis of the lanolin market by every segment of the market. The lanolin market report emphasizes on evaluating the market opportunities, and getting a comprehensive understanding of the lanolin market. The lanolin market report particularizes on the regional analysis, market dynamics, market structure, and competition landscape of the lanolin market for the next ten years, i.e. 2018-2028. Each section of the lanolin market report includes qualitative and quantitative assessment of the market on the basis of historical data or developments and facts and key opinions collected from various end-use industry participants through primary interviews, annual reports, newsletters, press releases, etc. The report on the global lanolin market includes some of the major players in the lanolin market, such as Croda International plc., Elementis Specialties, Inc., The Lubrizol Corporation, Maypro Industries, NK Ingredients Pte Ltd., and Rolex Lanolin Products Ltd., among others. The preliminary stage of the research analysis includes product mapping pertaining to the companies involved in the lanolin market, which is necessary for understanding the market scenario. Further, the application areas of different products were determined through primary and secondary research. Stages of research involved the counter-validation of data collected the by top-down and bottom-up approach. To analyze the market trends and opportunities for lanolin manufacturers, the global lanolin market has been segmented on the basis of grade, product type, application, and region. For the analysis of consumption, we have considered FY 2017 as the base year. Basic data was collected from manufacturers’ annual reports, newsletters, public reports published by government as well as private agencies, World Bank’s sources, FAO & IWTO sources, Trade Map sources, by wool production activities, etc. The collected data was validated through primary research techniques that involved manufacturers, distributors, end-user procurement agencies, and regional representatives. For the final analysis of market data, we considered demand-side as well as supply-side drivers and trends in various regional markets. We have forecasted the market data on the basis of key developments, regional trends, and production-consumption scenario of lanolin. The global lanolin market was valuated at around US$ 795 Mn in 2018, and is assessed to grow at a 5.6% CAGR over 2018–2028. On the basis of consumption, East Asia and South Asia Pacific are expected to register high value and volume growth in the lanolin market over the forecast period. Substantial growth of key industries such as pharmaceuticals, cosmetics & personal care, and leather & textiles, among others, in China, is the preliminary driving factor for the growth of the lanolin market. Low labor cost and production cost, and slightly lenient regulations regarding animal welfare in these regions would encourage manufacturers to expand their manufacturing facilities in these regions, which, in turn, is expected to drive the demand for lanolin. The lanolin market in Europe and North America is estimated to register moderate growth in the lanolin market over the forecast period. Shifting preference towards the adoption of plant-based or vegan personal care products is the main factor impacting the demand for lanolin. Increasing demand for bio-lubricants is surging the demand for lanolin, owing to increasing industrial activities. Increasing application areas in industrial applications such as bio-lubricants, anti-corrosive agents, metal cutting fluids, etc., are expected fuel the demand for lanolin. The increasing demand for high quality lanolin in the manufacturing of cosmetics & personal care products, and pharmaceutical products, coupled with the shifting preference towards the adoption of pharmaceuticals and personal care products comprised of natural ingredients, is anticipated to increase the demand for pharmaceutical grade lanolin around the globe. Lanolin is noted to be an active ingredient in the cosmetics & personal care industry for a variety of applications. Being used in several applications as an emulsifier, emollient, moisturizer, and stabilizer, lanolin serves as a one-stop solution for the cosmetics & personal care industry. It is also used in lip care product formulations, including lip balms and lipsticks. Being a high revenue-generating segment for the cosmetics industry, the growth of this segment will propel the growth of the lanolin market. Moreover, lanolin products are also used in several baby care applications, such as for treating diaper rashes, chapped lips, and skin eczema, due to their healing effect and moisturizing nature on tender and sensitive skin. The rising inclination towards using ultra-sensitive products for baby care applications is further fueling the demand for lanolin. Widespread growth noted in the men’s care product line is leading to a surge in several ingredients used in the formulation of the same. Lanolin is widely prominent in such applications, and is anticipated to remain driven throughout the forecast period. Rising disposable income has been termed as one of the significant factors pushing the demand in the cosmetics & personal care industry, and has an indirect, but considerable impact on the consumption of lanolin. The inclination of several end-use industries utilizing lubricants has been showcasing optimistic signs of shifting towards bio-based lubricants, rather than mineral oil-based lubricants. Such a trend showcases vast demand from the industrial sector to utilize lanolin as a lubricant in their applications. The rising awareness around the depletion of natural resources, including mineral oil, adds up to the growing demand, which is further fueled by the economic feasibility of using lanolin. The global lanolin market is a moderately fragmented market, due to the presence of unorganized local manufacturers. Moreover, ambiguities in raw material prices for lanolin has been observed in developed and developing regions. Fluctuating wool production in key regions, and increasing regulations pertaining to animal welfare and animal protection are affecting wool production, which, in turn, is affecting raw material cost. Some of the key market participants operating in the global lanolin market include The Lubrizol Corporation, Croda International Plc., Elementis Specialties, Inc., Nippon Fine Chemical, NK Ingredients Pte Ltd., and Rolex Lanolin Products Ltd., among others. Several key players maintain strategic focus on East and South Asia markets, due to increasing industrial activities and technological advancements.